NEW CELESTE NG! THIS IS NOT A DRILL! Fear not, my friends. 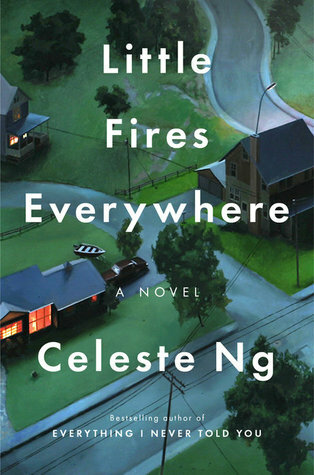 Celeste Ng has given us a new novel that follows themes used in EINTY but does not retread the same ground. Little Fires Everywhere opens with a literal house afire. The Richardsons’ spacious, gracious home in affluent Shaker Heights is burning down, torched by one of the family’s children, although we don’t quite know or understand why yet. The book then rewinds to the beginning of the school year, when an itinerant artist and her high-school aged daughter arrive in town and rent the Richardsons’ condo. The introduction of Mia and Pearl, with their different ideologies and desires separate from the monoculture of Shaker Heights, break up the Richardsons’ tidy lives, particularly the mother Elena’s routine, WASPY mindset. The disruption is, perhaps, not for the better. Pearl, having lived her entire life as a child constantly moved from one town to another, witnesses the comfortable lives of the Richardson children, who have never wanted for anything, and is quickly adopted into the children’s clan as friend and girlfriend. The Richardsons’ youngest daughter Izzy attaches herself to Mia, seeing in the artist a model for her own rebellion against Shaker Heights’ expectations. When a local adoption case pitting an affluent white couple against a poor Chinese mother becomes national news, Mia and Elena take opposing sides, prompting Elena to take drastic action and setting in motion events that will lead back to the raging house fire from the opening chapter. LFL is a house afire (pun intended) of a novel, where EINTY was a slow burn. The Richardsons appear to be a family that functions as a well-oiled unit, just like all the other families behind the placid facades of the houses in Shaker Heights, but the introduction of Mia and Pearl provides the grit that works between the crevices until the family fractures from internal pressure. Ng leaves no characters’ dirty laundry unaired. The children’s abject selfishness in claiming Pearl as “theirs” is fascinating because she’s never truly an intimate, more of a plaything. The color-blind racism of the 90s gets raked over the coals in this book, both through the custody trial that forms the B-plot of the book and how the characters so often pride themselves as being “not racist” when blinded by privilege. There is so much to digest in this book. There is a whole dimension of Mia’s art that is just breathtaking, so thought-provoking and provocative, that I want a museum gallery to come to life so I can look at the images for hours. If the flash-backs were your favorite thing in EINTY, you won’t be disappointed (though I did think that a flashback section in LFL overstayed its welcome at one point, but that’s a pretty minor quibble). Little Fires Everywhere is out today – an absolute Must Buy or Holiday Wishlist book. As the twentieth century draws to a close, Maria is at the start of a life she never thought possible. She and Khalil, her college sweetheart, are planning their wedding. They are the perfect couple, “King and Queen of the Racially Nebulous Prom.” Their skin is the same shade of beige. They live together in a black bohemian enclave in Brooklyn, where Khalil is riding the wave of the first dot-com boom and Maria is plugging away at her dissertation, on the Jonestown massacre. They’ve even landed a starring role in a documentary about “new people” like them, who are blurring the old boundaries as a brave new era dawns. Everything Maria knows she should want lies before her–yet she can’t stop daydreaming about another man, a poet she barely knows. As fantasy escalates to fixation, it dredges up secrets from the past and threatens to unravel not only Maria’s perfect new life but her very persona. Heartbreaking and darkly comic, New People is a bold and unfettered page-turner that challenges our every assumption about how we define one another, and ourselves. New People was a really interesting novel but I feel like I got lost midway through. Maria is a fantastic character – a woman who has always adopted identities starts to lose herself as her wedding date draws near and she finishes her dissertation about Jonestown. You don’t like her (actually, the only character I liked was her mom, Gloria) but you want to know what she’s doing next. But about midway through I started wondering where the plot was going – is Maria going to break up with Kamil? Shag this poet dude? Yell at Lisa? Go crazy? I really enjoyed Senna’s writing, though, so even if Maria’s narrative got a bit wonky I was enjoying the way Senna described the action.